This pattern works with a very flexible palette. Colors may be substituted to suit your needs, or use what you have on hand. 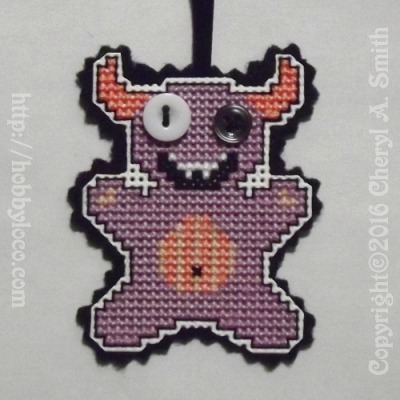 Mis-matched buttons may be used for eyes, which gives the monster an even cuter and unique appearance. This pattern is great for beginners. It is a solid and simple pattern with no half-stitches. This pattern works with a very flexible palette. Colors may be substituted to suit your needs, or use what you have on hand. Mis-matched buttons may be used for eyes, which gives the monster an even cuter and unique appearance. There is a little back stitching, which is completely optional. The piece looks wonderful with or without. Shown in the photo below, the pattern was stitched on 14 count plastic canvas, and measures just about 2" (5cm) x 2-1/2" (6cm). I backed the finished monster with felt and trimmed with pinking shears. I added a black satin ribbon loop for hanging - to add to my Halloween ornament collection. Click Here to open color printable pattern in separate window. Click Here to open black and white printable pattern in separate window. Please enjoy stitching these patterns for your personal use - but do not sell these patterns, or post to any website, or include in any pattern collection for sale without my permission. *You may link the stitched photo to a Pinterest pinboard, but please include the link back to this page. Thank you! All donations are sincerely appreciated and help the upkeep of this website and creation of more free patterns.